After my World Karaoke Tour was shut out in Italy, I headed north and hoped that things would go differently in the Netherlands and Belgium. Three train rides later, and some 16 hours after my departure from Venice, I rolled into the Dutch capital. Amsterdam is well-known for its Red Light District, where one can indulge in certain activities that are unlawful in most of the world. To gain a full flavor of the city in which I now found myself, I made sure to check out the Red Light District (strictly out of curiosity, of course). 🙂 Actually, I didn’t have to wait long after my arrival in Amsterdam to observe one of the city’s legalized vices: as soon as I disembarked from the train, I witnessed people smoking joints on the platform. I probably could have gotten high myself from the secondhand smoke that was wafting up from all of that cannabis. But doing the Cheech & Chong thing was unnecessary for me. As this blog reflects, singing karaoke provides a natural high for me. So, although many tourists in Amsterdam end up in that city’s “coffee shops”, I set out in search of a venue where I could indulge my addiction to song. Happily, that quest proved much more successful in Amsterdam than it had in Rome; and on Tuesday night, August 31, 2004, the Netherlands became country no. 6 on my World Karaoke Tour. My concerns about my song selection proved unjustified; the young scholars responded with enthusiasm to my rendition of “Footloose.” If this was their introduction to the song, it had made a favorable first impression on them. My trademark H-Bomb leg kick at the end of the song didn’t hurt. And my Amsterdam karaoke appearance marked the first time that I uttered what would become a signature line for me at my appearances in foreign venues: “New York City is in the house!” This too helped endear me to the audience. In addition to “Footloose,” I performed four other songs over the course of the evening. I couldn’t tell you what those other songs were, as I neglected to document that information (The name of the bar where my singing took place has also long since been erased from my memory banks). The next day, I emailed my friend Doug in New York to tell him about my singing experience of the night before. In his response, Doug wrote, “You should’ve had a World Tour T-Shirt made up for yourself.” I believe that email exchange marked the first time that I or anyone else referred to my karaoke globetrotting as a “World Tour.” (The name of the concept would soon evolve to “World Karaoke Tour”). Doug would repeat the t-shirt suggestion on multiple occasions over the ensuing years, but I still haven’t gotten around to having any World Karaoke Tour t-shirts printed up — even though the number of countries in which I’ve sung has subsequently quadrupled. Amsterdam was a scenic locale for the newest appearance on my emerging World Karaoke Tour. 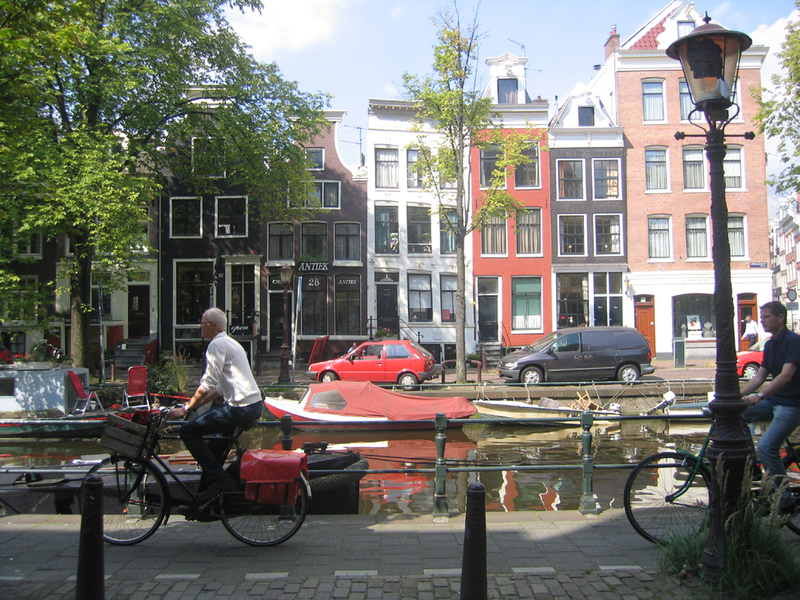 Like Venice, it’s a city of canals; indeed, the Dutch capital is among a handful of cities that have been dubbed the “Venice of the north.” However, the broad, tree-lined canals of Amsterdam are very different in character from the narrow aquatic avenues that course through Venice. Another distinction from Venice is that bicycles, rarely seen in Venice, are a familiar sight alongside the canals of Amsterdam. Some of the best views in Amsterdam can be had inside its highly regarded art museums. Two of those repositories of creative excellence, the Rijksmuseum and the Van Gogh Museum, are among the premier art museums in the world. The Rijksmuseum specializes in works from the Golden Age of Dutch painting, including a number of masterpieces by the likes of Rembrandt and Vermeer. The Van Gogh Museum showcases the world’s largest collection of works by its eponymous one-eared dude, as well as paintings by some other superstars of the impressionist and post-impressionist movements, such as Monet, Manet, Seurat, Toulouse-Lautrec, and Van Gogh’s frenemy Gauguin. Both the Rijksmuseum and the Van Gogh Museum were on my itinerary; so was the Anne Frank House, where you can explore the actual building in which the famed diarist hid from the Nazis. All of those museums were as advertised. And it’s nice to look at pretty pictures, or to stroll through historical sites that make the past come alive. But one of the greatest pleasures for me when traveling is to discover random stuff that’s quirkier than the more conventional tourist draws. 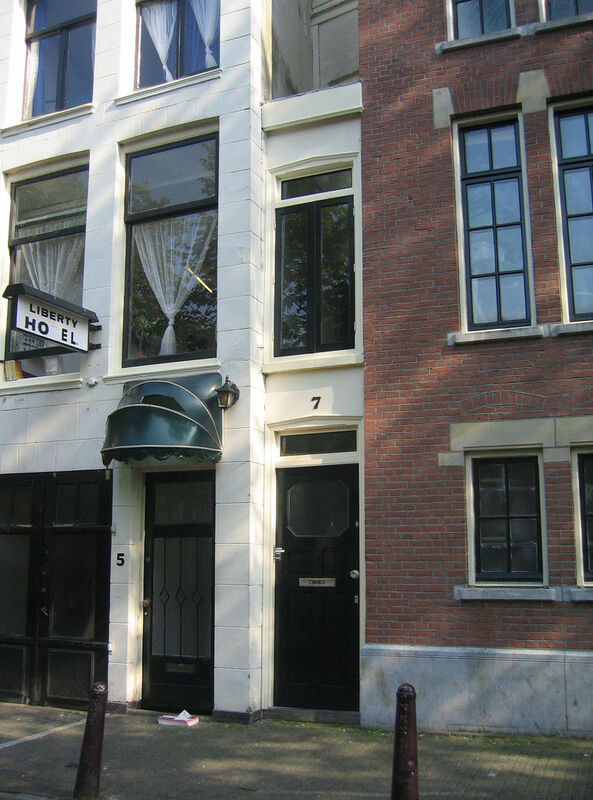 One example from Amsterdam: I got a glimpse of a home that’s reputed to be the narrowest house in the world. No wider than its front door, the residence located at Singel no. 7 (seen here) will never be mistaken for a McMansion. I would have liked to have stepped inside; I was curious as to what type of furnishings could fit in such a slender space. Alas, Singel no. 7 is a private residence, not open to the public. During my sojourn in the Netherlands, I also ventured into the Dutch countryside, to Zaanse Schans, part of the town of Zaandam. When I’d been planning my trip to Amsterdam, one goal had been almost as important to me as singing karaoke. With the possible exception of La Mancha, Spain, no part of the world is more popularly identified with windmills than the Dutch region of Holland. Thus, I’d felt strongly that I couldn’t go to the Netherlands without getting up close to some of the windmills that are so emblematic of that area. Zaanse Schans is essentially an open-air museum, containing a number of well-preserved 18th-century windmills and houses; so I did get my wish of seeing some authentic mills with their hypnotically rotating sails. 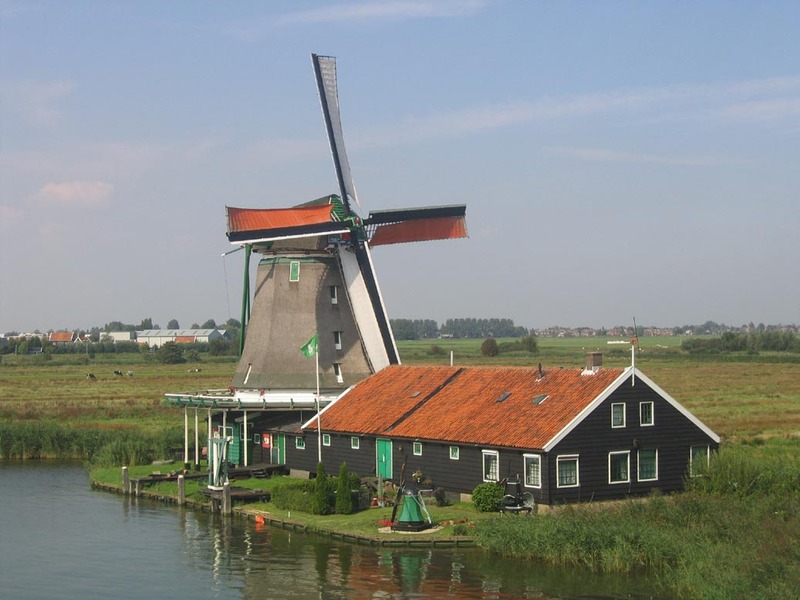 One of those windmills from Zaanse Schans can be seen in the photo at the top of this blog post. My two and a half week EuroTrip was winding down as I proceeded to Brussels — the capital not only of Belgium, but of the European Union. 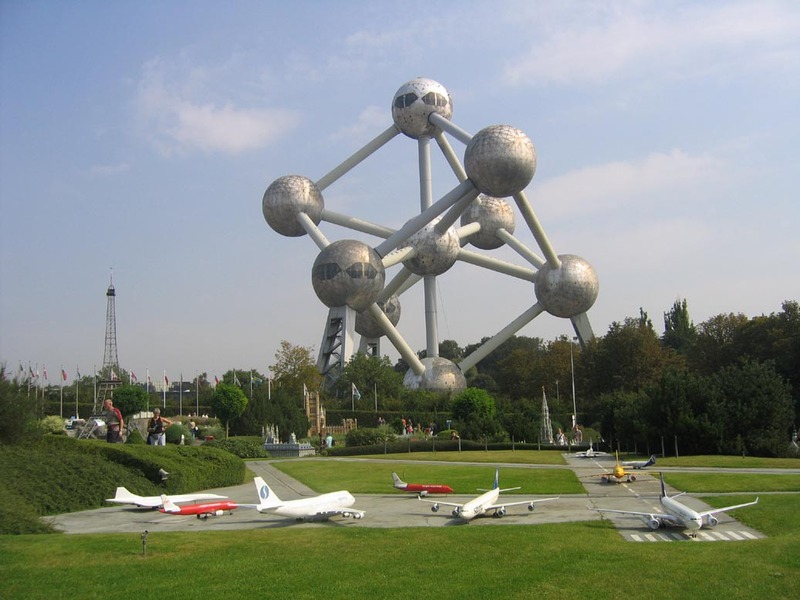 Another unique monument in Brussels is the Atomium. Built for the 1958 World’s Fair, the Atomium is a replica of an iron crystal, magnified 165 billion times. The structure stands 102 metres (335 feet) in height. Visitors can enter inside its spheres; the observation deck in the uppermost sphere offers panoramic views of the greater Brussels metropolitan area. Others of the Atomium’s spheres contain rooms with funky artistic experiences; and some of the escalators that connect the spheres are themselves colourfully decorated. 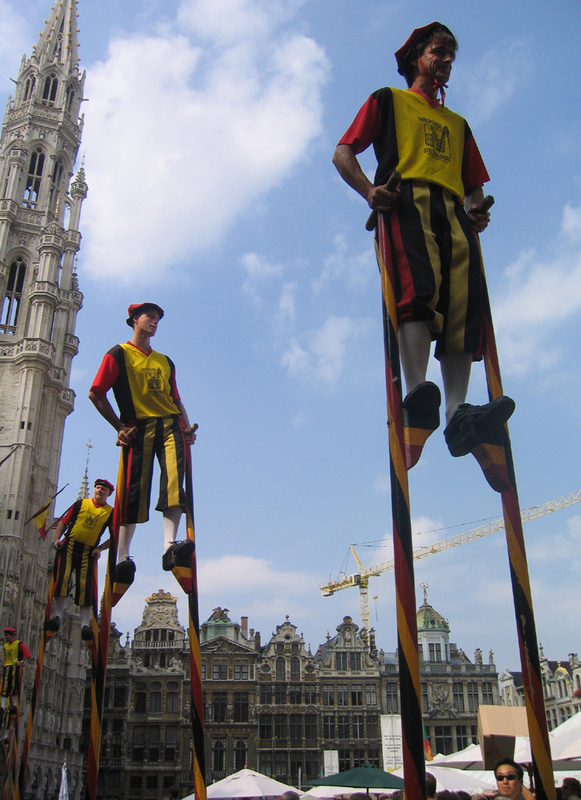 As mentioned above, Brussels is the capital city of the European Union. So it’s only fitting that, nearby to the Atomium, you can find Mini Europe — a theme park that contains 1:25 scale replicas of various European landmarks, such as the clock tower that houses Big Ben; the Eiffel Tower; the Parthenon; and the Leaning Tower of Pisa. There’s even a miniaturized reproduction of some airport runways, featuring scale models of jet airplanes (although the airport is unspecified). Given my interest in architecture as well as travel, a stroll through Mini Europe was high on my to-do list for Brussels. My objective of singing in yet another new country had been swiftly achieved. But there was no letdown during the remainder of my stay in Brussels. Saturday in Belgium was a busy day for me. 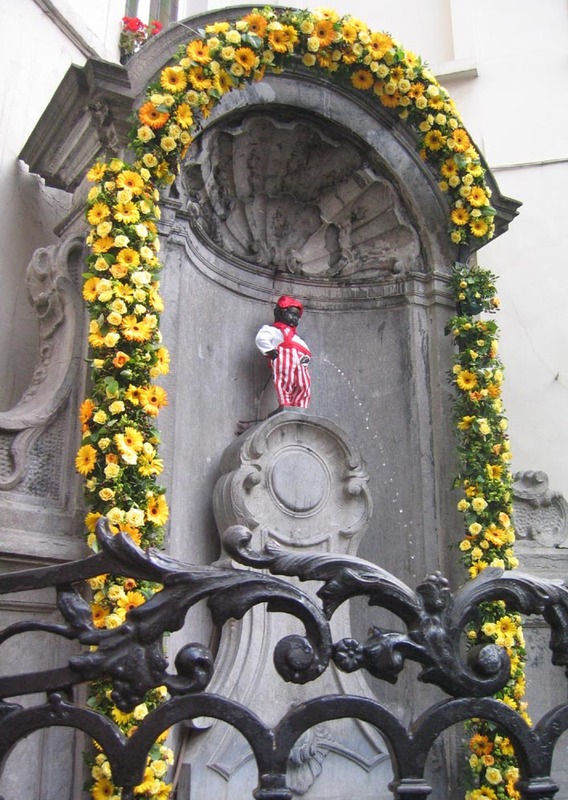 Not only did I visit the Manneken Pis, the Atomium, and Mini Europe; but I managed to squeeze in a half-day excursion to Bruges, which is about an hour’s train ride from Brussels. Bruges is one of those cities in Old Europe whose town centre still retains its look and feel from the Middle Ages. Here you can see the building that stands at the heart of old town Bruges: the Halletoren, also known as the Belfort (bell tower). 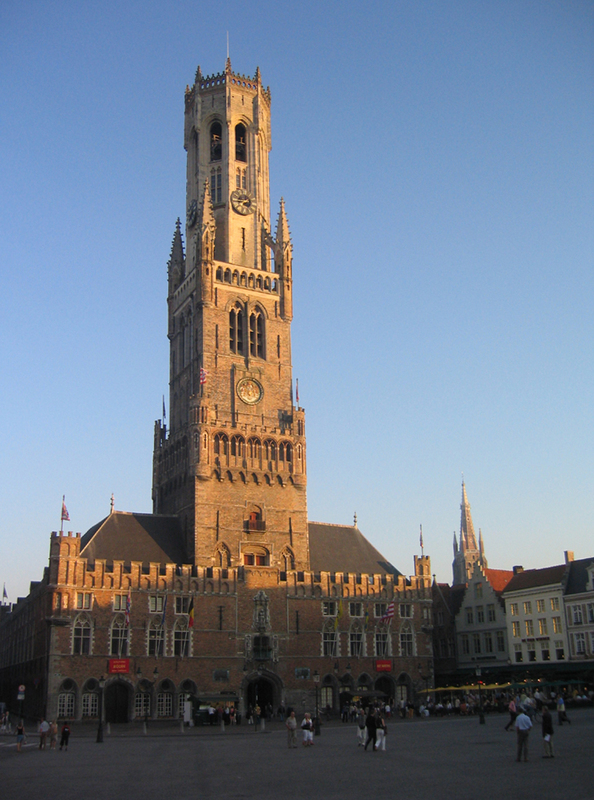 At 83 metres (262 feet) in height, it soars over most of the medieval edifices in its vicinity, and serves as Bruges’ most recognizable structure. In addition to its surviving medieval quarter, Bruges is celebrated for its canals; indeed, it’s one of Amsterdam’s rivals for the sobriquet of the “Venice of the north.” I took a pleasant cruise on one of those canals. Bruges was a nice capstone to my vacation. There was, however, one place I’d wanted to get to that I’d failed to reach on this trip. While perusing my Eurail timetable, I’d noticed that Paris was only one and one-quarter hours away from Brussels by train. I’d been to Paris once before, in 1993, but I wanted badly to return. I knew that I would appreciate that city so much more the second time around; during the intervening years I’d read a number of literary works that take place in the City of Lights, and had also read extensively on the history of the city that was known to the ancient Romans as Lutetia. In particular, reading Victor Hugo’s novel Notre-Dame de Paris (often known to English speakers as The Hunchback of Notre-Dame) had infused me with a desire to once again walk the streets of the city that Hugo described so lyrically. My motivations for revisiting Paris were thus similar to the reasons that I’d made an encore visit to Rome during an earlier segment of the European vacation that I was now on. 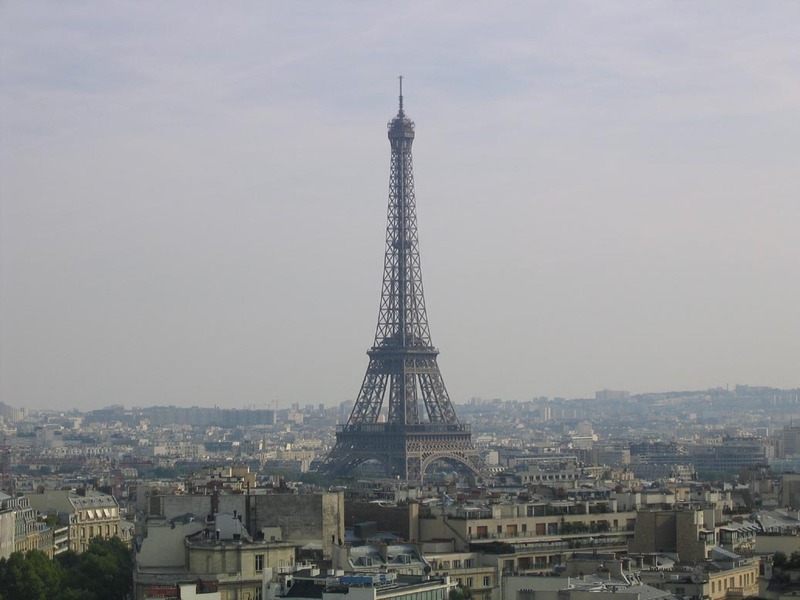 Unlike Rome, however, Paris was not on my original itinerary for my 2004 European vacation. But now it was so tantalizingly close! The only problem: I’d run out of time. When I returned to Brussels after my day-trip to Bruges, it was Saturday evening, September 4. I was scheduled to fly home to New York the following morning. For the previous several days — starting when I was in Amsterdam — I’d been in contact with Delta Airlines in an attempt to reschedule that flight to Monday, which was a legal holiday (Labor Day) in the United States. If I did that, I would still be back at work on the next American business day. Not that I should necessarily care whether I missed an additional day of work; during my preceding 2 1/2 weeks of travels, I’d already made the momentous decision to quit my horrible job when I got back to New York. But my efforts to extend my vacation by one day had been unsuccessful. My airline ticket, which had been acquired by redeeming American Express Membership Rewards points for free airfare, was equivalent to a ticket that had been purchased with frequent flyer miles. Only a limited number of seats on each flight are allocated for such “award travel.” All such seats on the Monday flights from Brussels to New York — both from my airline and from its code-sharing partners — were already spoken for. I offered to fly back to a different American city, such as Boston or Baltimore or even Cincinnati or Atlanta, if it would enable me to get back to the U.S. I also volunteered to get myself to Amsterdam or London, or some other such alternate city, to catch my flight out of Europe. I’d gone to the airline’s website and had specific flight number possibilities to suggest to the airline’s call center representatives. Alas, I was told that all of the alternative flights I’d suggested were sold out, or at least had no remaining seats that qualified for award travel (perhaps not so surprising for a requested travel date, on short notice, of the last day of a holiday weekend). On Sunday morning at about 9:00 a.m., my bags were packed and I was ready to head to Brussels Airport. I’d still had a fantastic trip, but I was disappointed that I wasn’t going to make it to Paris this year. Before checking out of my hotel, I perfunctorily made one last call to the airline — and was unexpectedly told that I could postpone my departure to Monday! Even better, that switcheroo did not require a change in my cities of departure or arrival; I would still be flying from Brussels directly to New York. So after quickly extending my hotel stay , I hustled to the train station and caught the next available train to Paris. This journey into Paris was only a day-trip. I didn’t have the chance to seek out karaoke, which is usually a nighttime activity. But a little more than a year later, I would return to the City of Lights — this time, with the goal of adding France to my World Karaoke Tour. I could easily spend the day getting lost in the Atomium. Their website says that only 5 of the 9 spheres are open to the public. I wonder what the other 4 hold? 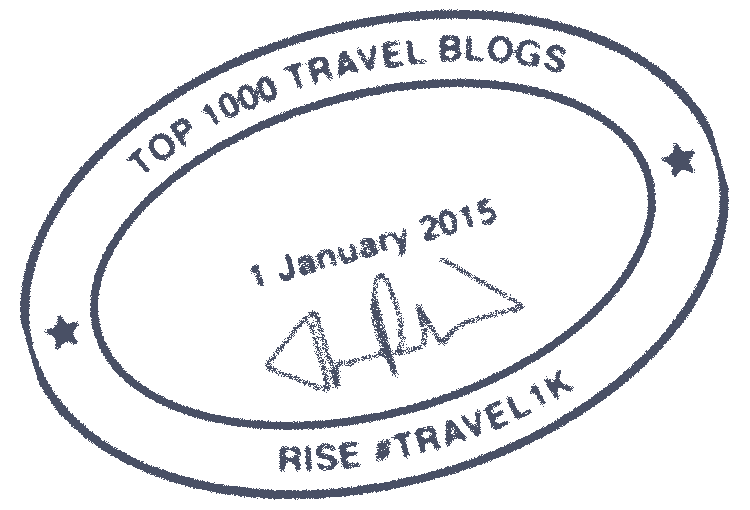 Admittedly, the phrase “technical areas” is kind of vague. (The two spheres that are available to rent out for your next event probably don’t hold much of anything in them). First of all, I did not miss the section you mentioned above. And secondly, I also thought “technical areas” sounded mighty vague. On a third note, too bad Belgium isn’t closer – I would suggest hosting a large hbombkaraoke bash in one of the spheres for rent! @WCBFF: Inside one of those spheres would be an awesome setting for karaoke! On a par with the Bear Pit in Berlin.